#YoSoy132 Aguascalientes, 7 July 2012. Photo courtesy of the author.Today we cannot imagine the world without the internet. 23 years ago we could not imagine a world with it, nor the social movements and rural indigenous movements that utilise it, but it happened. 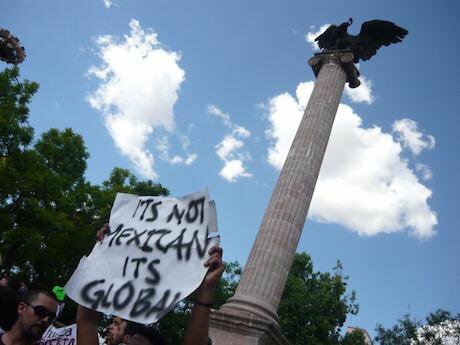 This article reflects on the link between the internet and social movements in Mexico. First, I describe some cases of uprisings and mobilisations, transnational organisations, and local activist collectives. Then I point out some key elements about the internet and public expression, and conclude reflecting on the power of networks. 1 January 1994 was the day that NAFTA (North America Free Trade Agreement) went into force, in Mexico, the United States, and Canada, as a neoliberal conquest. But on that same day, a voice emerged in the Mexican jungle: the Zapatistas took up arms in Chiapas. In their first declaration — “Today we say stop!” — they tried to make visible the inequities caused by neoliberal politics. They also situated their struggle in a global arena. The internet was becoming the most important tool to gain international solidarity. Although in that time the Zapatistas did not have access to information technology, an American student created the first Zapatista website, and shortly after appeared various websites, mailing lists and discussion forums about the uprising. The Zapatista movement has been in existence ever since, sometimes in silence, sometimes in the spotlight. In 2005 and 2006, they led “The other campaign”, an initiative of participation towards social change from below and to the left. Recently, they have made headlines with the proposal of taking part in the 2018 Mexican elections, presenting an indigenous woman as presidential candidate. During these years, the internet has played a role in many different Mexican mobilisations, such as #YoSoy132, the Movimiento 5 de Junio, the Movimiento por la Paz con Justicia y Dignidad, No + Sangre, the mobilisations for Wirikuta and Ayotzinapa, as well as other mobilisations. #YoSoy132 (I am 132) emerged in 2012, after the participation of then-presidential candidate Enrique Peña Nieto in a university forum. The students protested against him, whilst the Mexican mainstream media presented false news about the achievements of Peña Nieto and rubbished the protesters. As a response, the students made a video: “131 estudiantes de la Ibero responden” (131 Iberoamerican University students respond). In just a few hours, more students of various universities expressed their solidarity and started the movement #YoSoy132, first online through hashtags and later in the streets, with demonstrations across the whole country and even abroad. Like other contemporary social movements, it combined the occupation of places and spaces with digital strategy. The activists made intensive use of sociodigital networks and started strong digital media production. Indeed, they organised a debate between the presidential candidates, produced and streamed online. In contrast to the official debates, this one involved citizen participation. Violence, corruption and impunity are entrenched problems in Mexico. Various mobilisations have made them more visible. 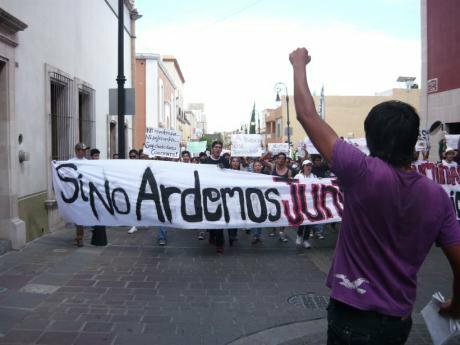 The Movimiento 5 de Junio (Movement 5 June) emerged in 2009 in Hermosillo. It is a citizen movement demanding justice, after a fire in a nursery killed 49 babies and injured 70 more. Their parents accused the local government of neglect. They took the path of protest, from Hermosillo to Mexico City, and also by way of the law, fighting their case in court and proposing a new law on nurseries. The group have used the internet for public expression through a website, Facebook, Twitter and YouTube. Their mobilisation remains active over the years, as a painful memorial of that fire. The Movimiento por la Paz con Justicia y Dignidad (Movement for Peace with Justice and Dignity) was one of the most important mobilisations against violence in Mexico. President Felipe Calderón’s term (2006-2012) was marked by the war on drugs as a security strategy. In this period, violence escalated between state forces (military and police) and organised criminal groups, among different criminal groups, but also against the citizens. Calderón justified the resulting large number of deaths of citizens not related to criminal groups, calling them “collateral damage”. The son of Mexican poet Javier Sicilia was one of those deaths — killed along with six friends by a drug cartel in 2011. After that, Sicilia started a national movement. The most powerful expression was a caravan through Mexico and the US with the aim of underlining the situation of the victims, and creating an itinerant place for dialogue among their families. The movement had a strong presence on the internet, again through a website, Facebook and Twitter. In the same year, famous Mexican cartoonists such as Rius, El Fisgón and Helguera, among others, started a mediated and digital mobilisation: No + sangre (No more blood). The initiative was also a reaction to Calderón’s war on drugs and its unfortunate consequences. They produced cartoons and made them public to be reproduced in protests, but also on Facebook walls and Twitter accounts, as a digital expression of disagreement with the security strategy. In 2014, students from the Normal Rural de Ayotzinapa were attacked, some of them were killed and 43 more were kidnapped. The case made evident the links between the local police and organised crime. The Mexican government was severely questioned about human rights abuses by police and military forces, as well as on its constant failures in research into these cases. Ayotzinapa was the most visible case, but it is not the only one, as Mexico has a long history of state violence against the civil population, such as the cases of Acteal, Aguas Blancas, Atenco, Tlatlaya, and Nochixtlan. After the shooting in Ayotzinapa came expressions of solidarity across the country and across the world, through demonstrations in the streets and on the internet. In recent years, we have also witnessed some other experiences of searching for missing people and protests against those disappearances, murders, and feminicides in Mexico, such as #TodosSomosJorgeyJavier in Monterrey or Andrea Nohemí in Aguascalientes. In those movements, leaders used sociodigital networks to gather people who would support demonstrations, to diffuse information about the mobilisation and and for collaboration across cities and countries. The environment is another arena of struggle in Mexico. Since 2010, various organisations joined in the Frente en Defensa de Wirikuta (Front for the Defense of Wirikuta). The Mexican government has authorised a Canadian mining corporation to hunt for silver and other metals in a territory that includes Wirikuta, which is both a protected natural area and a Wixarika sacred area. The mining project violates Mexican laws and also threatens the environment, the right to water and health, and the rights of indigenous people and their cosmogony. In 2013, after national and transnational mobilisations, the project was stopped, but not completely cancelled. The Front use the internet to disseminate information, through a website and a Facebook page. In 2015, Salvemos Manglar Tajamar (Save Manglar Tajamar) started after heavy machinery was used to clear a mangrove area in Cancun. Various environmentalist groups acted in opposition to this initiative. They denounced the killing of animals (some of them at risk of extinction) and the damage to the environment. Their strategy included fighting in the courts as well as online, and sociodigital networks allowed them to draw international awareness to the destruction. Sadly, Tajamar is not the only case in Mexico. Environmentalists have led mobilisations in various cities, such as SOS Mezquitera La Pona / Salvemos La Pona (Save La Pona), fighting against the urbanisation of a protected natural area in Aguascalientes, and Salvemos el Bosque de la Primavera (Save La Primavera Forest), a similar situation in Guadalajara. Transnational activist organisations, such as Greenpeace and Amnesty International use the internet as a key element in their communication strategies. They use websites, mailing lists, e-petitions, sociodigital networks, and other resources to increase their visibility as organisations and to raise specific ecological or social problems. They combine their own global logics with the localisation of contents and protests. Greenpeace has global lines of action about oceans, agriculture and more. On the theme of oceans, in Mexico they focus on the case of the vaquita and the risk of extinction here. The campaigning on agriculture has focused on the struggle against Monsanto, because of the transgenic corn projects that have affected local biodiversity and human rights. Amnesty International has global lines on torture, indigenous people, disappearances, among others. These have been priorities in Mexico, where Amnesty have organised specific campaigns to stop torture, to defend the rights of indigenous people and especially to fight against disappearances in extrajudicial executions, feminicides, and the kidnapping of Mexican and Central American migrants in transit to the United States. These transnational organizations, as well as others like Oxfam, Article 19, Reporters without Borders, make expansive use of digital media to diffuse their campaigns, especially through sociodigital networks, mailing lists and e-petitions. Digital networks have also been a key element for local activist groups based on everyday experiences in the pursuit of social change. These are small collectives, locally based but sometimes globally connected through the internet. They are not as visible as national mobilisations, or transnational organisations. They normally work in medium and long-term timeframes, with routine activities on human rights and gender issues, environmental education, animal protection, sustainable consumption, cultural practices and so on. As I mentioned earlier, the threats against the environment are strong concerns in Mexico. Some collectives work on permanent actions to defend the environment through everyday actions. For example, Conecta Bosques works on reforestation projects in Guadalajara, and Conciencia Ecológica works on environmental education in Aguascalientes. Other groups work on animal protection, which includes permanent actions on rescue, rehabilitation and adoption placements, as well as working to educate people about animal rights and lobbying with policymakers and local authorities to protect them. 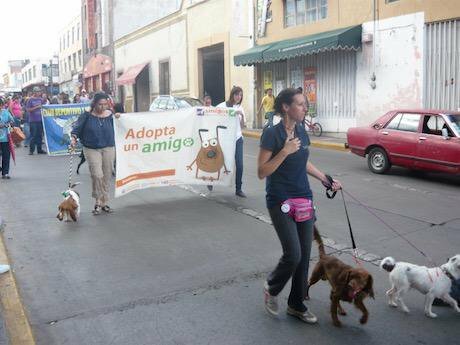 Such is the case of Amigos Pro Animal and Gatos para Tod@s in Aguascalientes, Adopta Guadalajara in Guadalajara, and Fundación Animare in León. Libros Vagabundos, 11 October 2014. Photo courtesy of the author. The concerns about the environment also involve projects of sustainable transport in cities. Cycling has been promoted as an ecological, healthy and cheap method of transportation, for example by Guadalajara en Bici Movilidad Sustentable in Guadalajara, Bicicálidos / Aguas con la Bici in Aguascalientes, Vida sobre Ruedas in San Luis Potosí, and some other groups across the country. The pursuit of a better world includes new ways of thinking about the future. 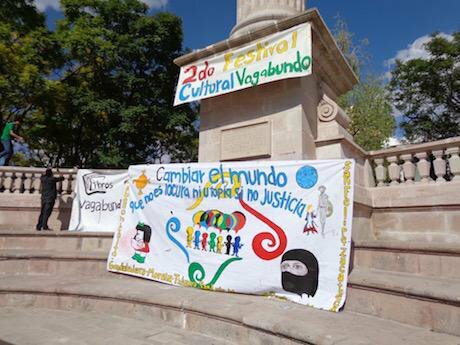 Libros Vagabundos started as an experience in the #YoSoy132 camp in Aguascalientes, offering a free library on the streets, cultural projects and events. The aim is to make a more critical society through reading and other cultural practices. They argue that a critical society has the potential to change the world. The project was replicated in more than 30 cities in six Latin American countries: connections all made via Facebook. For local everyday activists, the internet is a free expression space and a way of being connected with similar initiatives all over the world. While transnational activist organisations have professionals working on digital communication strategies, in local groups the responsibility is usually assigned to their more engaged members, who work in their free time in an amateur way, learning by doing. They use sociodigital networks for diffusion, organisation and socialisation purposes. The internet matters for social movements, because it is one of the cheapest and easiest routes of access to public expression. It does not replace the squares and streets, or even the media, but provides a different space where users can spread their worldviews without intermediaries. The mainstream media is still an important space in Mexico — over 90 percent of households are equipped with television — but just 40 percent of households are equipped with the internet. Though the mainstream media is a key element of public space, most outlets are now private enterprises. Additionally, there are trends of media ownership concentration, and when lots of the media is in a few hands, there is a big risk to plurality. Civil society, for example, is underrepresented in Mexican media. Mobilisations are often uncovered, and even criminalised by mainstream media, framing the most conflictual or violent episodes of protests. Internet is the way activists express themselves and get visibility. Through the worldwide web, they can expose local problems and connect them with global discourse. They also meet people who share concerns and dreams about a better world. The networked, interactive and global logic of internet enables these information flows. In the pursuit of visibility, virality matters. When some digital publications on a cause or event become viral, visibility escalates in a short period. For example, the #YoSoy132 movement owes its initial spark to a couple of viral episodes: firstly, when the students protested against Peña Nieto and shared a lot of material on Facebook, Twitter and YouTube, in real time. Secondly, (and maybe the most important), when the activists published the video 131 estudiantes de la Ibero responden. It was shared thousands of times and gained international visibility for the movement. The mainstream media had to cover them after that. The internet is also the way to connect people. Through the internet, activists make connections on different levels: within their groups themselves, with other groups and citizens, locally and all over the world. The key element is the way affinities work. People share interests, concerns, dreams, hopes, lifestyles, and more. The internet is the contact point for groups that are permanently working on a specific cause, but also when discontent converges and new mobilisations start. These connections were very relevant in the case of the Zapatista movement. Even when they did not have access to digital technologies, others contributed to start and sustain solidarity networks across the internet and across the world. We have to consider the interweaving of digital and social networks. That is the reason why some authors refer to them as sociodigital networks, to highlight the link between digital networks — with their technological base, algorithms and logics — and social networks — with their specific contexts, backgrounds, affinities, concerns, dreams and hopes. The power of networks in the global age is not about technology itself or society itself, but about the way in which digital technology is nowadays a constitutive part of our social life. We should not be naïve about the internet. We should recognise that its possibilities for democratic participation must not obscure its intrinsic problems of freedom, privacy, surveillance and the digital divide. But that recognition need not undermine the relevance that the internet and sociodigital networks have had for social movements in Mexico as well as in other countries. As I said earlier, today we cannot imagine contemporary social movements, or even the world, without internet. But the world is changing all the time. We have so much further to go and so much more to learn.